We test all of your appliances using a fully calibrated Portable Appliance Tester, our PAT testers come with pre-set tolerances to Australian Standards, ensuring integrity in our testing process. Once the appliance has past the electrical testing process, it is then fitted with a durable, non-reusable tag to indicate to users that the item has been identified as safe in accordance with AS/NZS 3760:2010 and when the item is due to be tested again. You will be provided with a computer generated log book and detailed asset register, listing the appliances tested and the results of the tests undertaken. The asset register also records the make, model and serial number of the appliance during the electrical testing process. If the appliance fails any stage of electrical tagging, the technician will consult with the client as to the process needed to repair, quarantine or dispose of the appliance in question. Once our technician has tested and tagged all of your electrical appliances, you can rest assured that you have done all you can to minimise any electrical shock or fire risks within your place of work. 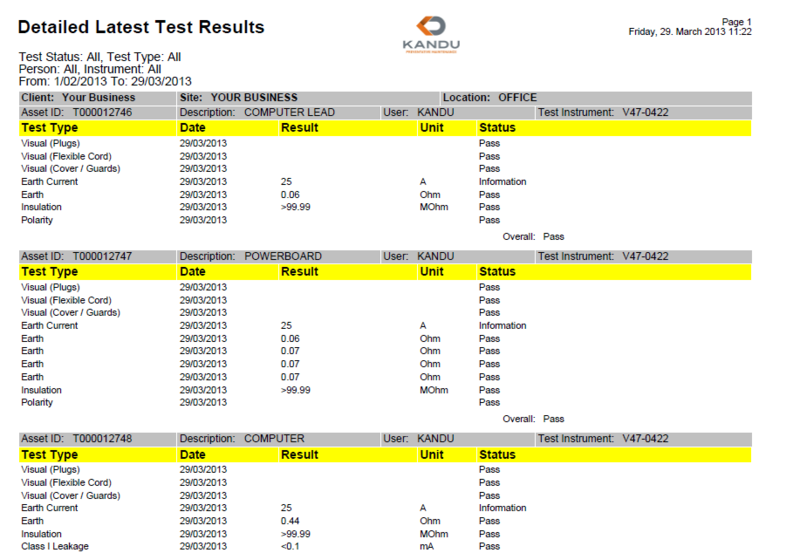 KANDU Preventative Maintenance base the frequency of electrical testing on the minimum requirements detailed in the Australian/New Zealand Standards and take into account if the items are deemed to be in a hostile environment. Our technicians are able to perform an electrical risk assessment to assist you if required. Can detect faults in all electric, electronic and mechanic equipment. Minimises potential electrical shock or fire risks within the workplace. Our test and tag appliances service helps your workplace become safe and compliant to Occupational Safety and Health Regulations in an efficient and in a cost effective manner. Find out more about our Test & Tag Prices or fill out our online form for a Test & Tag Quote. Why not call KANDU today and find out more about our test and tag appliances service on 1300 79 11 74, or email info@kanduservices.com.au you’ll discover how easy and affordable it is to have real peace of mind when you deal with a trusted test and tag appliances specialist.